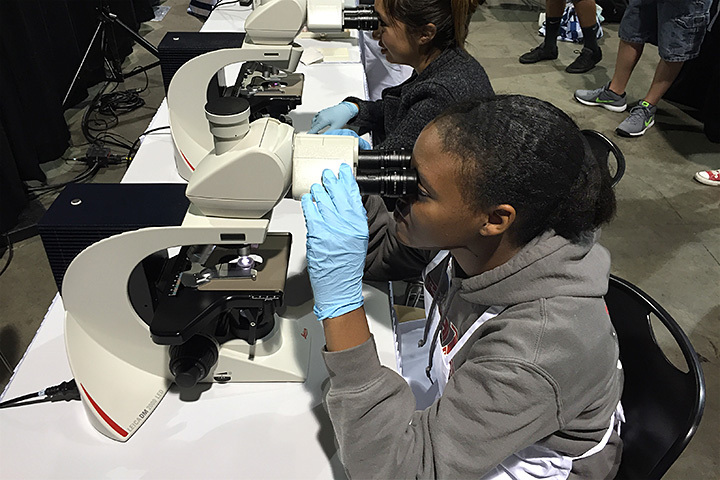 Cabrillo High School and Sato Academy of Mathematics and Science students interested in the medical field conducted lab tests using the latest technology as part of the recent National Society for Histotechnology annual conference in Long Beach. Histotechnology involves the detection of tissue abnormalities and the treatment for diseases. High schools in the Long Beach Unified School District offer students more than 40 career pathways, including several that emphasize health and medicine, offering students real-world experience to prepare them for college and high-paying, high-demand jobs. HISTOTECHNOLOGY – Sato Academy of Mathematics and Science student Anaya Blade examines tissue samples on a microscope slide that she created.